One of my favorite traditions from my childhood was sitting down to a family dinner every evening. We’d talk about our day as we ate a meal together. This was always a tradition that I knew I wanted to continue when I grew up but I’ve discovered as a parent that it’s a hard tradition to keep. Between sports, school commitments, work schedules and everything else, finding the time to make dinner and sit down as a family every evening is tough! 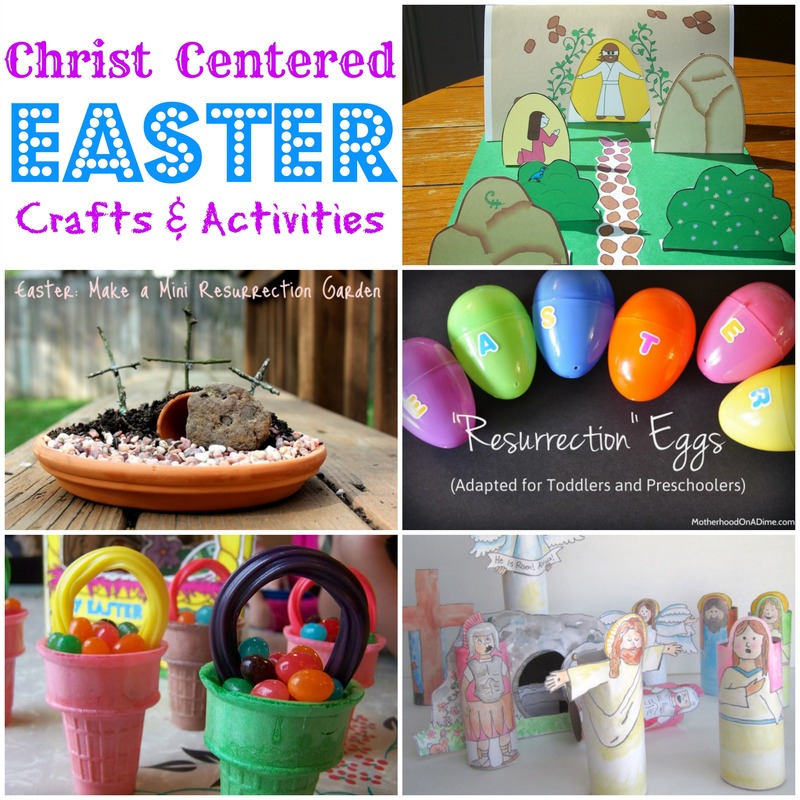 The best way I’ve discovered to make this tradition happen for our busy family is to stick to simple meals. 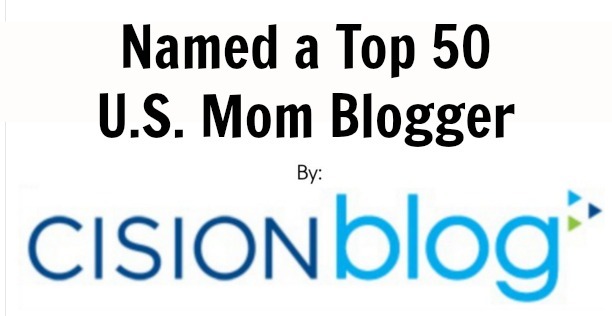 With easy meals I spend less time in the kitchen and more time with my kids. 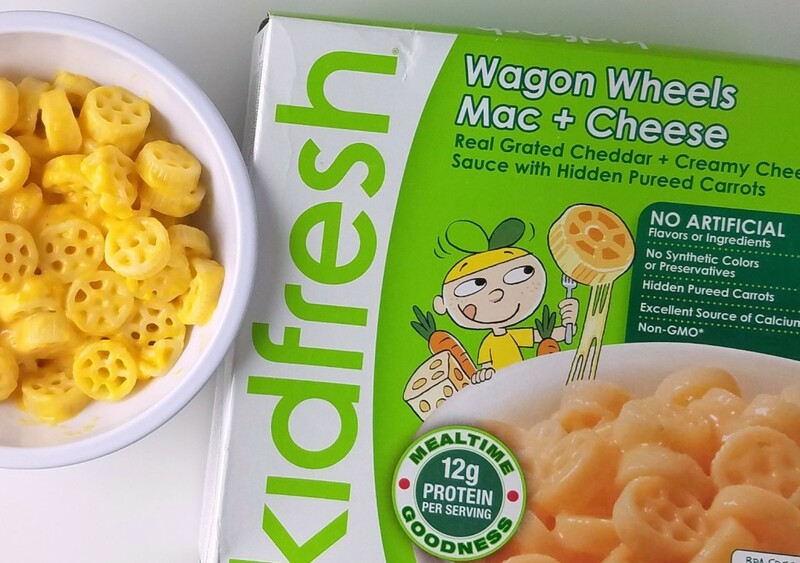 My favorite meals are ones that I can just heat up and that’s why I love Kidfresh frozen meals for the boys. 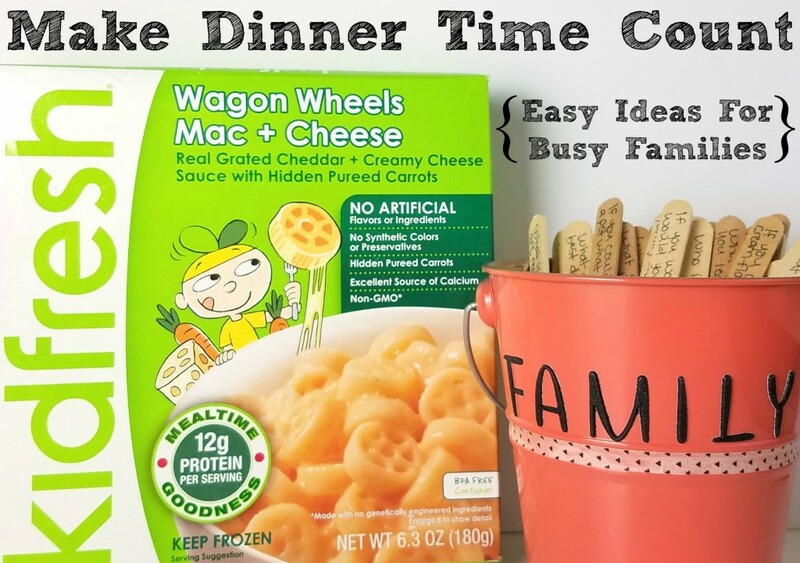 They are so convenient and perfect for our busy evenings because they are ready in just minutes! It’s a relief to know that I can still provide my family with quality meals, even when I’m short on time. 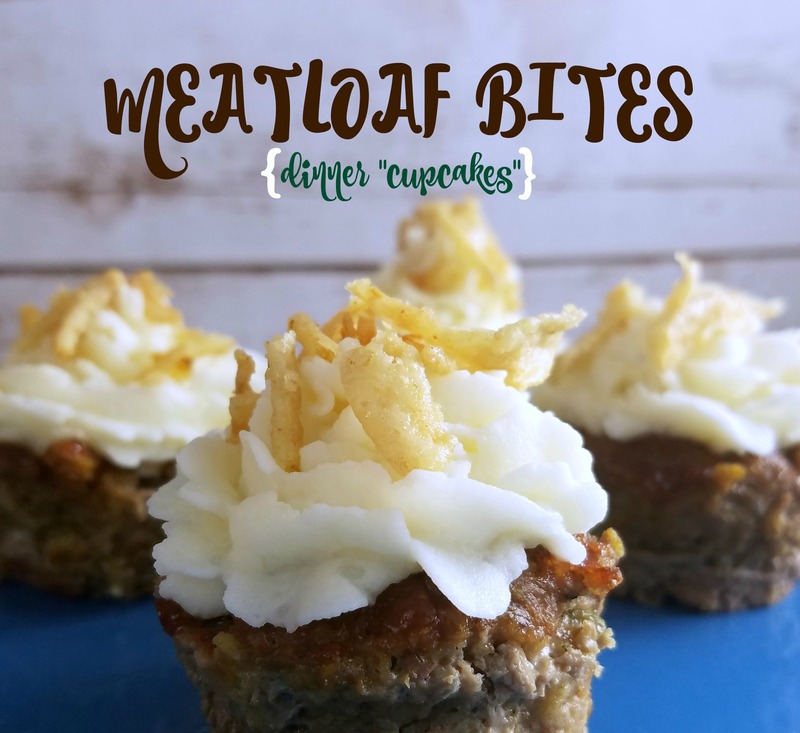 Not only are they quick to make, but they are meals that I feel good about giving my boys because they are from a credible brand I trust. Created with the help of a top chef and a pediatric nutritionist, Kidfresh meals are consistent with USDA dietary guidelines for all children and they offer the best in kids nutrition. 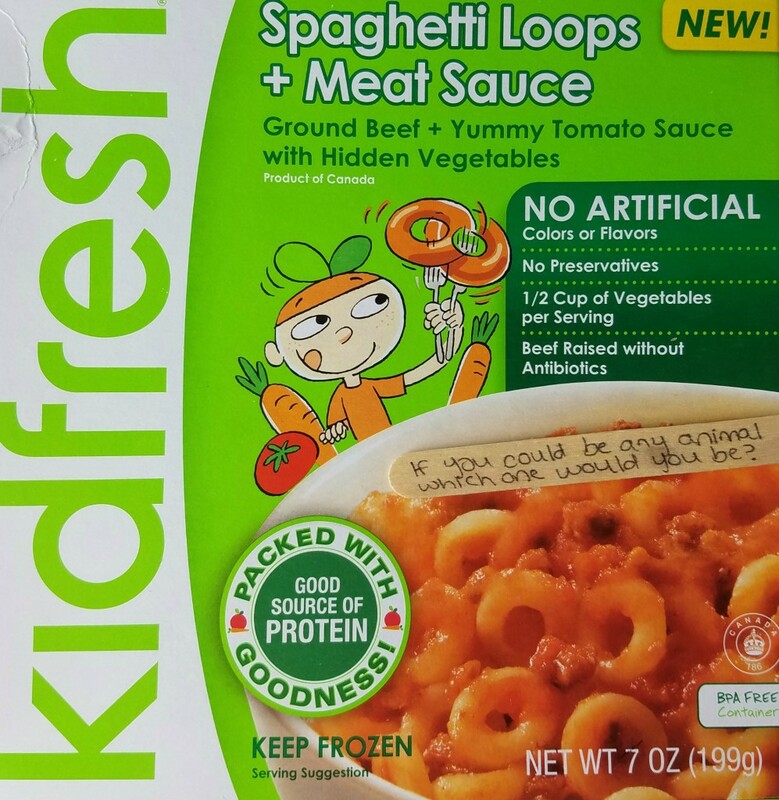 Kidfresh meals contain no artificial flavors or ingredients and are full of nutrients that growing kids need. They also are full of veggies. 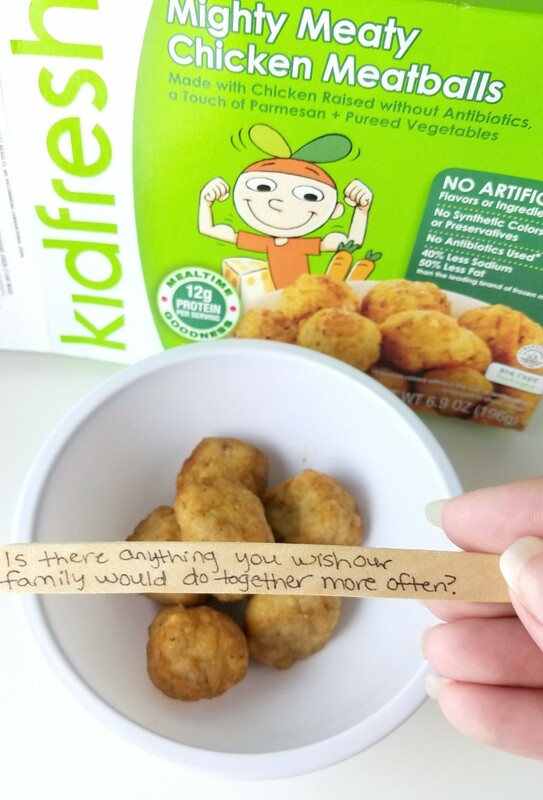 Each Kidfresh meal is made with up to ½ cup of hidden vegetables so even the pickiest of kids (like my youngest!) will eat their veggies. 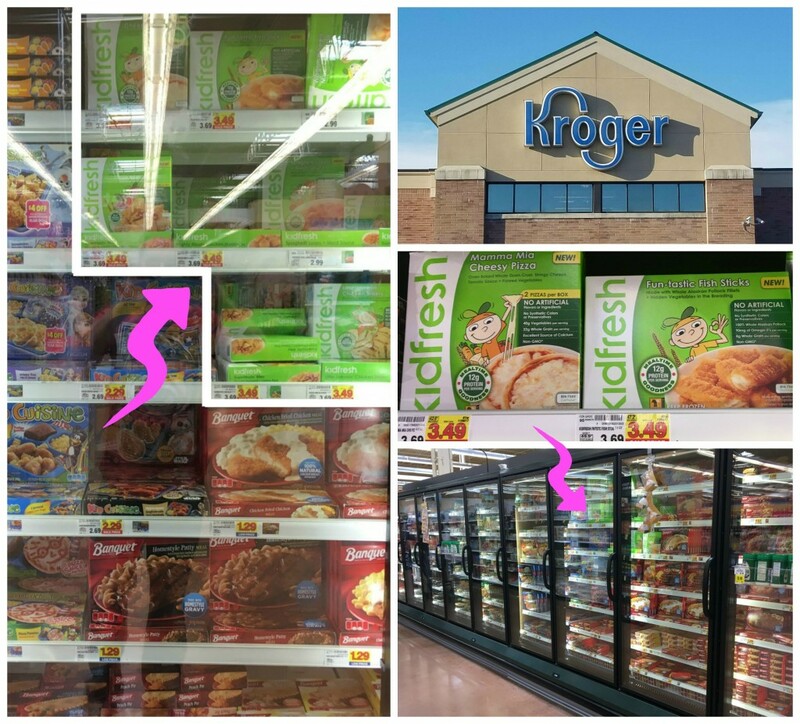 We found our Kidfresh meals and sides at Kroger in the freezer cases near the other single serve dinners. For a limited time at Kroger and Kroger family of stores you can save at least 15% off the everyday retail price at Kroger! 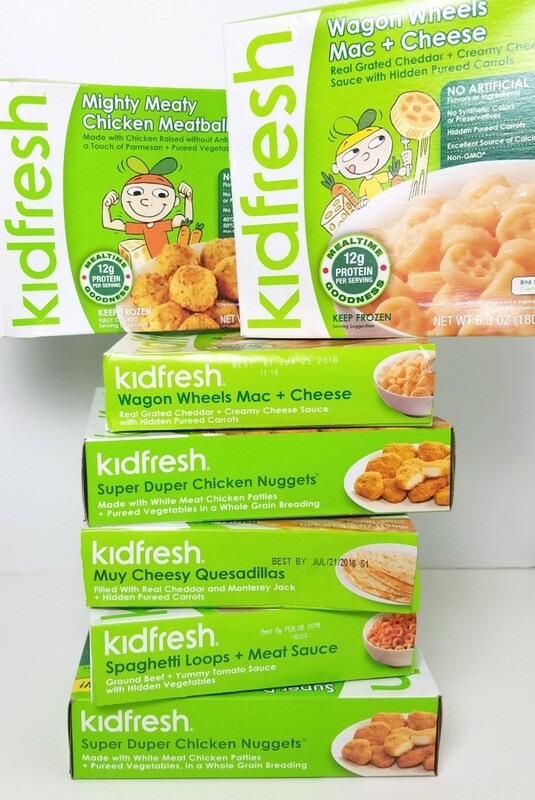 There were a variety of Kidfresh choices available including: Wagon Wheels Mac + Cheese, Spaghetti Loops + Meat Sauce, Muy Cheesy Quesadillas, Super Duper Chicken Nuggets, Mighty Meaty Chicken Meatballs, Fun-Tastic Fish Sticks, Totally Rockin’ Tots and SuperBlastin’ Bites. 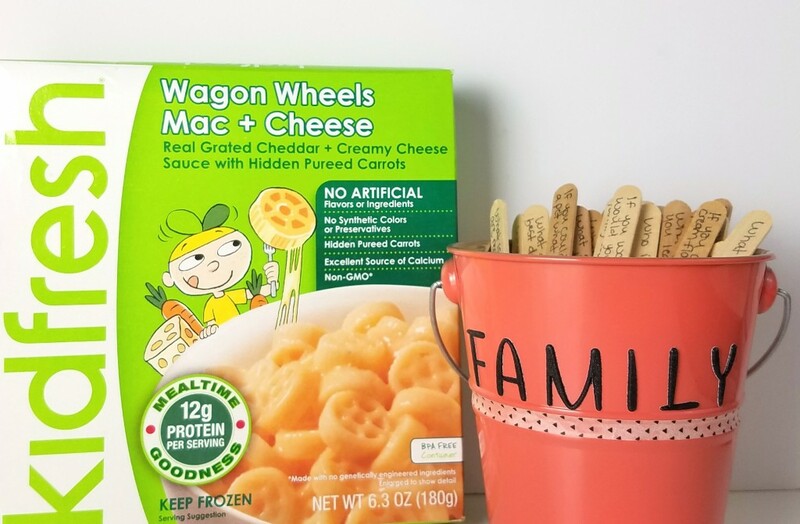 My boys love all of the Kidfresh meals they’ve tasted so far, especially the Wagon Wheels Mac + Cheese and Mighty Meaty Chicken Meatballs. 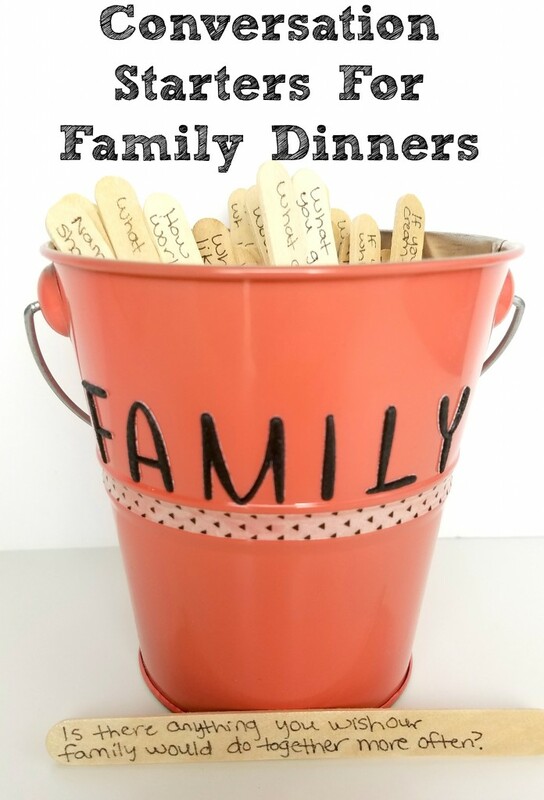 To keep the conversation going while the boys are enjoying their Kidfresh meals, and to avoid the typical answers of “fine” and “okay” when asked about their day, I created a conversation starters bucket to keep on the kitchen table. 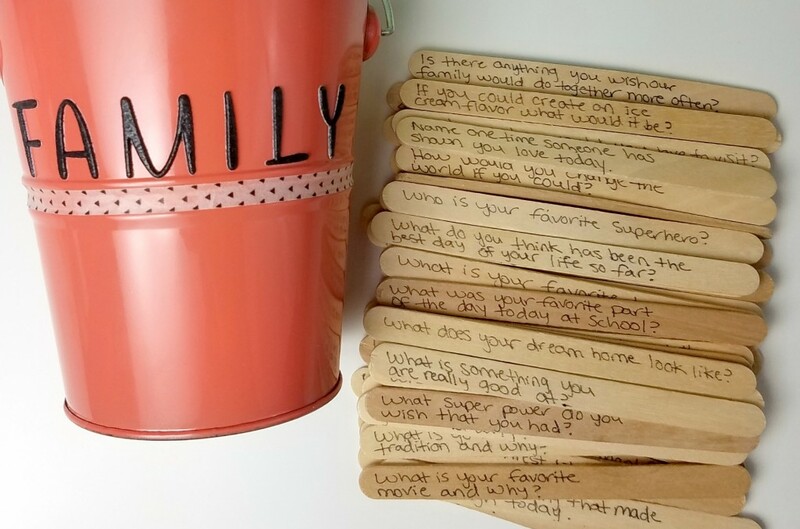 I wrote down about 50 questions on craft sticks that would require more than a “yes” or “no” answer and would hopefully start a conversation. The questions ranged from silly (“if you could stay up all night, what would you do?) 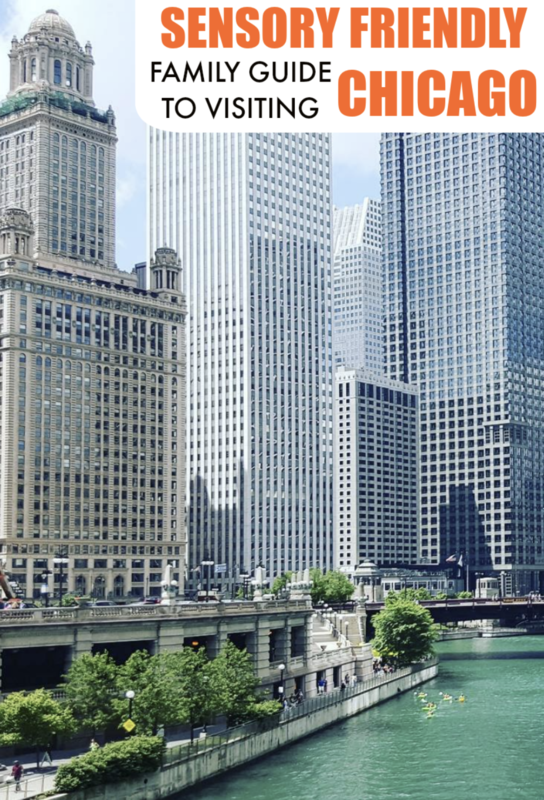 to personal (“what is something you like about yourself?”) and from simple (“what is your favorite book?”) to complicated (“describe your dream home”). 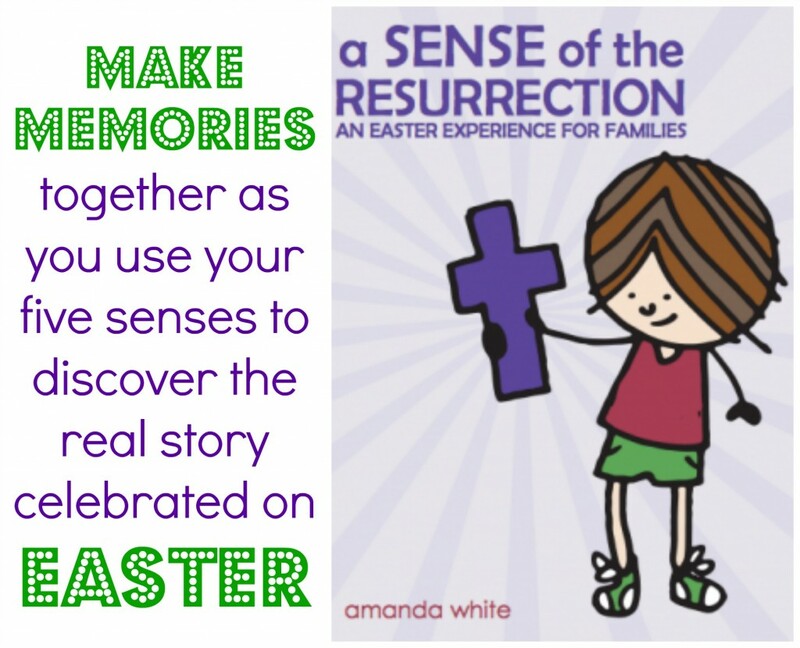 The best part is that, as the boys get older, the questions can be changed and new questions can be added so they remain relevant to our family. 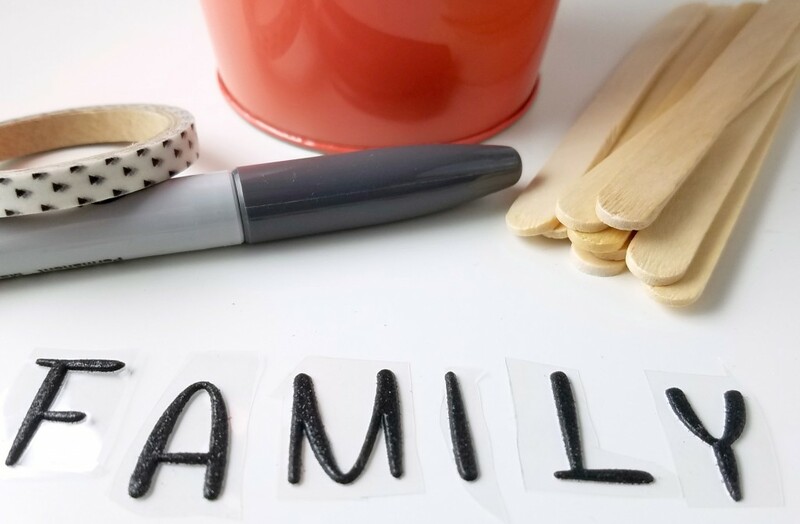 I then put them all in a small bucket that I decorated with washi tape and letter stickers that spelled out “family”. I love how it turned out and am excited to use it for years to come. How do you make your family dinners count?